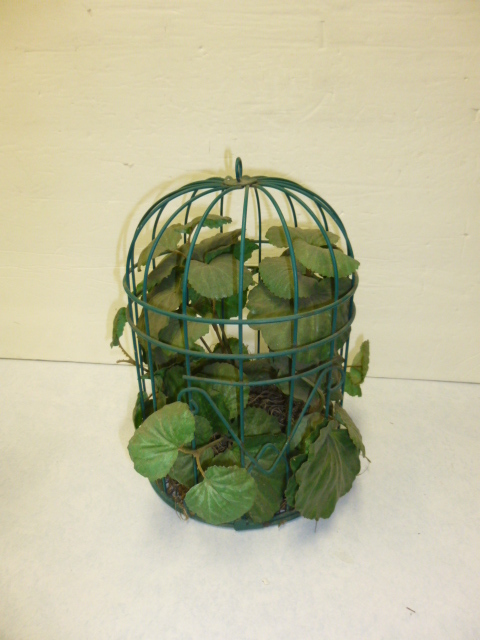 Saw this sad and dusty little bird cage filled with faux greenery at the thrift store. Upon closer examination I could see that the greens were just ‘sitting in there’ in a piece of green styrofoam; and not GLUED or wired in place. AND it was half price! IN my cart it goes! I can always, ALWAYS use (SELL!) just about any kind of birdcage. 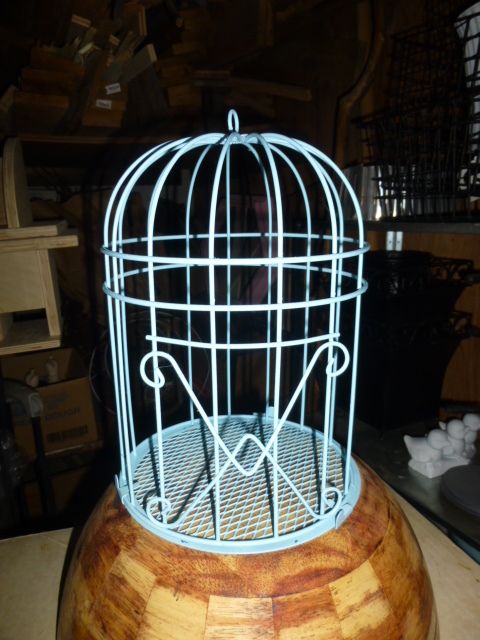 I recently painted two similarly shaped cages white, I decided to go Aqua on this one. Just dumped out the dusty greens, washed the dust off the cage and let it dry. Then spray painted it. I have a cute white bird pedestal that will look cute inside this. * When I am considering bird cages to buy, one ‘bonus factor’ that I look for is that they open up ALL the way. On this one the entir bottom comes off so I can easily display stuff inside. On the white cages, the entire dome top opens up. 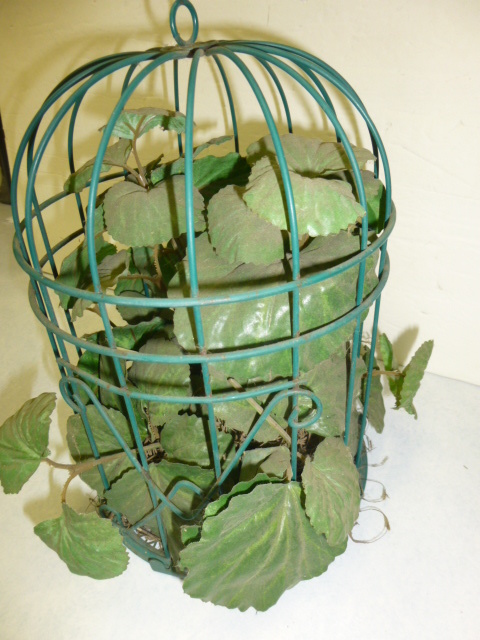 I still will buy ‘real’ cages that only have a tiny cage opening, and they still sell just as well. But IF I can find them like these they are more fun to use in displays. 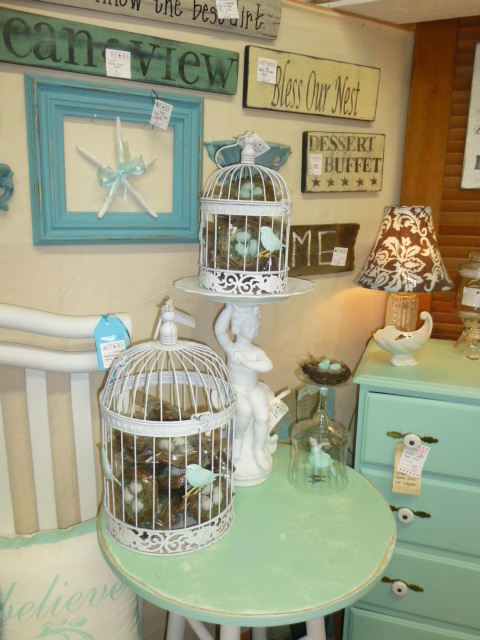 I love bird cages too! Just like you, I’ll buy just about any I can find because they always sell. I love doing them up for Christmas the best, followed by Spring. Good job with this one!